It's soup season. Have you noticed? We've got a ton of snow. Like, a TON. 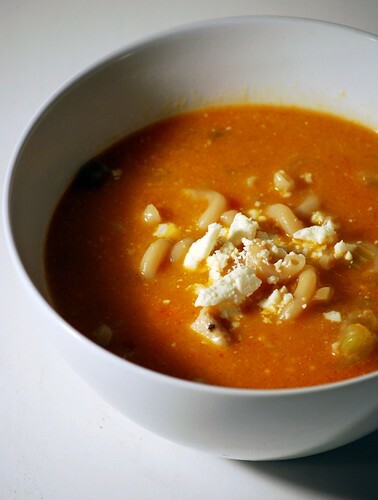 Now is the right time to eat a hot, spicy, creamy soup. This is it. Dredge the chicken cubes in rice flour, and sprinkle with salt and pepper. Melt the butter in an appropriate soup making pot, and brown the chicken on all sides. Once browned, remove the chicken from the pot and stir in the vegetables. 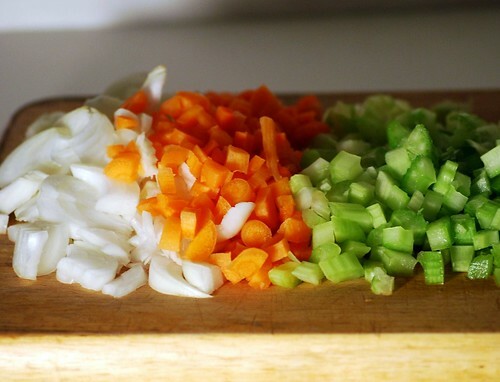 Cook the vegetables 15 minute over medium-low heat until softened. Add the chicken and any juices that have oozed out, then stir in the chicken broth, hot wing sauce and noodles. Watch out, the soup will be much spicier once it cooks for a few minutes than it will when you start! Bring to a simmer and cook about fifteen minutes, until noodles are tender. Stir in the blue cheese, and serve with extra blue cheese just in case. Interesting! I would have never considered a buffalo chicken soup. I love wings, so why not? This sounds amazing, and just perfect for these cold days of February!! Sure to be a hit with the buffalo chicken addicts in my house. Buffalo Chicken Soup! I think I just found dinner! Sounds amazing! That is one tasty soup! I like the use of the blue cheese. Was searching for a spicy soup & this post came up! Just what I was looking for. Going to add it to my have to try list. :) Thanks!